INTERCONTINENTAL STADIUM. Team USA has won the XXVI 18U Baseball World Cup in Taichung. On Sunday evening at Intercontinental Stadium they edged out Japan 3-2 in a thrilling Gold Medal Game to defend their title from last year. RBI singles by Bryson Brigman and Keaton McKinney drove in the decisive go-ahead runs in the sixth and seventh. 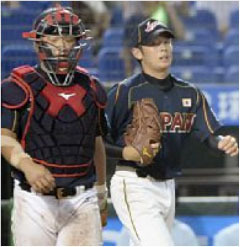 Japan’s starting pitcher Yuki Matsui, who received the starting nod over Tomohiro Anraku, dominated early on, striking out eight in the first four innings. However he also walked two and hit three batters during that time. In the fourth he ran into trouble, loading the bases with two outs. A fielder’s choice at second saved him. For now. One frame later Japan took the lead on a Takahiro Kumugai RBI single with Ryuma Mori crossing the plate. He got hit by a pitch with one out and moved to second on a wild pitch. After a fly out, Kumugai laced a single through the middle of the infield to put Japan ahead. But the United States came right back. Cole Tucker and Michael Rivera broke up the no-hitter with singles in the bottom of the frame sandwiched around a Trace Loehr strikeout. Adam Haseley followed with a slow roller to second baseman Nobuyuki Okumura and beat out the throw to first to avoid the double play allowing it Tucker to cross the plate. In the sixth Team USA got in front. After two loud fly outs to center to start the bottom half of the frame, Jackson Reetz placed a line drive down the left field line for a double. Bryson Brigman then dropped a fly ball shortly in front of center fielder Ryuma Mori driving in Reetz to make it 2-1. One inning later they added a crucial insurance run with a two-out single by Keaton McKinney. He drove in Loehr who had chased Matsui (6+ IP, 5 H, 3 R, 2 BB, 9 SO) from the game with a leadoff single. US starter Brady Aiken matched Matsui pitch for pitch early on and eventually won the pitcher’s duel. He gave up five hits, a run and two base on balls, while striking out ten. Luis Ortiz replaced him in the eighth and promptly gave up a run. Takahiro Kumagai worked a seven-pitch walk to lead off the frame, stole second with one out and cut the deficit to 2-3 on a two-out single by Satoshi Sonobe. However it was only a little hiccup. Ortiz hit a batter with two outs in the ninth, but closed it out by striking out the side. Earlier on Sunday Cuba defeated Chinese Taipei 6-1 to claim the Bronze Medal. They scored four runs in the first two innings en route to the win. Korea used a game-ending triple play to edge out Venezuela 6-1 for fifth place in the final standings. MATSUI faced 1 batter in the 7th.